The potence of personality is certainly incalculable. Someone such as Mother Teresa, whose teaching would actually cause the greater bulk of the modern world to writhe, takes an enshrined place in popular consciousness due to the force of her personality. Also the force of personality often acts as an effective point of unity far beyond the lifetime of the person. The Salesians, the Jesuits, the Carmelites, and others hearken back to the memory of a founder. The memory of a founder, however, is rarely a leak-proof source of unity. Quite divergent strains among Franciscans claim legitimacy from their founder. The same problem exists within the Catholic Worker Movement. That Dorothy Day is still the common denominator among the Worker houses and publications, there is no doubt. While there is only one history of the Catholic Worker Movement itself, there are several biographies of Dorothy Day. Two major conferences at Marquette University have been devoted to the thought of Dorothy Day, and from the more recent conference comes Dorothy Day and the Catholic Worker Movement: Centenary Essays. These essays, however, underscore the truth that the recorded life and thought of a past charismatic founder can be cited to opposing ends. Several essays within the collection contradict one another, so that a novice on the subject might complete the volume no longer with simple ignorance about Dorothy and the Worker, but now with vast confusion. For thousands of years, with a sin-clouded vision, man has made two simplistic assumptions about the path of time: Watching the march of days, he has assumed that time is infinite linear progression; or observing the rise and fall of all things, he has assumed that time is cyclic repetition. The first group, I suppose, we can call liberals, and the second, conservatives. Anyone taking a too hasty look at Dorothy Day would see primarily the epiphenomenal aspects of her work — war protests, strikes, soup lines, civil rights marches, independent journalism, jail — and might drop her into the first category. David O’Brien’s essay is an example of this, replete as it is with such terms as “social change,” “the peace and justice agenda,” a “social gospel spirit,” “faith-based opposition to violence, racism and social injustice.” Yet if one intends to discuss Dorothy’s “peace and justice agenda,” he must proceed from a fixed, transcendent vision of the specific natures of peace and justice. The O’Brien essay’s repeated references to a “Catholic Left,” an “American Catholic Church,” and “liberal Catholicism” bespeak an overall emphasis on historical process; for they highlight historical manifestations of the Church while failing to see that the Church is beyond time. Where in O’Brien’s essay is the fixed center? Where is the image of Christ that Dorothy saw in all she did? Dana Konopka’s fine portrait in this book includes the quote from Dorothy: “The mystery of the poor is this: That they are Jesus, and what you do for them you do for Him.” O’Brien, though, argues this: “We should go to the poor…not to relieve their woes through our generosity, not for the sake of the Church as a form of evangelization, but for the sake of ourselves so we might live with integrity.” It’s all about me. More dissonance in the O’Brien essay concerns the matter of “alliances.” The essay optimistically concludes that “All the elements of a powerful and important social movement akin to the Catholic Left…remain.” He adds, “What is missing now are the alliances.” With whom? With: “A) secular liberalism with its social reform agenda, B) broad-based social movements like those for peace and civil rights, and C) trade unions, the only sturdy defenders of working people….” However, O’Brien disapprovingly cites the alliance of Catholic bishops, in their prolife efforts, with “conservative politicians opposed to Catholic teaching on many other questions.” For the sake of “social change,” though, O’Brien seems happy to form alliances with others opposed to Catholic teaching. One of the most far-fetched essays, and one which is clearly carried away by what I earlier called the epiphenomenal aspects of Dorothy’s work, is Matthew R. Smith’s, which argues that “The Catholic Worker Movement is a form of liberation theology.” Once again, an author has failed to find the fixed point in Worker theology. Smith sees only simplistic parallels: “Both groups are responding to the abuses of capitalism,” “Both groups are movements which work for peace, justice and freedom,” and “Both movements arose in the Western Hemisphere.” The only substantial comparison in Smith’s essay is that which he makes between the Worker’s and liberation theology’s concept of “Dynamic theology.” Substantial, yes — simply because it is the only comparison that attempts to probe into the heart of things, into the theological foundations of both movements. The attempt, however, fails immediately, for it is based on a complete misunderstanding of Catholic Worker co-founder, Peter Maurin. By “dynamic theology,” a liberation theologian means a theology that grows out of and responds to the practical needs of the economic underclass, that proceeds from history (and what’s so dynamic about that, I’ll never know). Both Maurin and Day, however, understand the nature of theology too well ever to accept such an idea. The Catholic Worker was and is theo-centric, not historo-centric. If Dorothy and the Worker, then, do not stand among those on the Left who pledge allegiance to historical process, do they belong on the Right, among the conservatives? Bill Kaufman considers the possibility, adding, “If Buckley and Kissinger were the sum of the American Right, mine would be a very short paper indeed.” He does go on, however, to detail the Worker’s affinity with what he calls “The Old American Right” — agrarians, distributists, federalists. Happily, in the midst of his essay appear words and phrases not usually found in the political discourse of the Right (or the Left): “the holiness of work,” the “sacramental quality of property,” the “little way,” the “way of love.” These words express a transcendent vision beyond historical processes explicitly described in several of the volume’s essays. In other words, only he who dwells first on the mystery of the Church and the Mystical Body can grasp the radicalism of Dorothy and the Worker. But Catholic Workers (the real ones) understand what St. John teaches about work. The real work, the real creativity, is love. Only love, no matter how historically insignificant it might seem, can create; and no work, no matter how well financed, if done without love can be fruitful. The vision here is not on time, either as line or as circle. The vision is on Christ, whose cross-nailed body unites both points, vertical and horizontal, time and eternity. Aeternitas nunc. 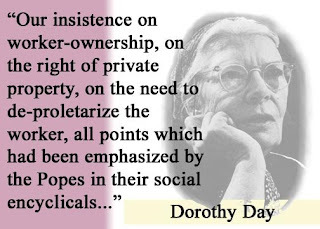 If I may say so, I grew up with Dorothy Day. She was part of my family culture. Many of the names found in this volume of essays I first found sitting at the dinner table — Robert Coles, Frank Sicius, Marc Ellis, Dorothy Day herself. I never, ever could think of Dorothy outside the context of the Church; and to discuss her in any other context is senseless. Several essays in Dorothy Day and the Catholic Worker Movement, then, contribute little or nothing to our understanding of Dorothy and the Worker. To compare Dorothy’s ideas to those of the Shakers or Buddhists or liberation theologians is, again, to be distracted by the epiphenomenal aspects of Worker life and action. I find this collection of essays, then, somewhat weak in focus. Nevertheless, on the whole I was surprised to find that for some, Dorothy’s vision of Christ is still brilliantly clear.